Here at Give a Book we love to collaborate and work with other like-minded organisations and charities. 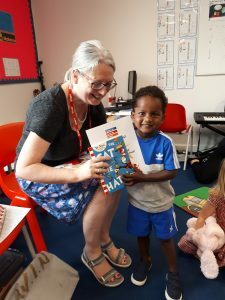 So earlier this year, we were very happy to be introduced to Teresa Harris of Learn to Love to Read, a charity who train volunteers to help and encourage children with reading in the Wandsworth area. We were lucky enough to attend one of their after school Story and Craft sessions and heard first hand from both staff and parents what an impact the Learn to Love to Read volunteers were having on the children and their enthusiasm for reading. 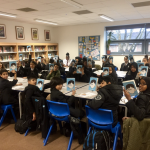 We are now working in partnership withLearn to Love to Read and have gifted books to those children who finished the sessions at the end of the Summer term. 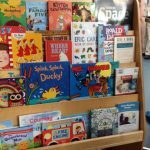 We are now hoping to help provide books for the new reading sessions starting at the start of the new school year this September. What inspired you to set up the charity and why? And also when? I first became interested in how children learn to read when my own children found the process difficult. I became a reading volunteer with two different charities and also studied difficulties in literacy development with the Open University. In 2013 I started volunteering independently in a school on a local housing estate. I soon realised that the impact I could have as an individual was limited, so I came up with a plan to recruit more volunteers and Learn to Love to Read was born. In March 2014 I recruited 6 volunteers from within my local church (St Michael’s in Southfields), gave them some training based on my own experience and began supporting Key Stage 1 children in one school. I decided that to increase our impact we also needed to reach children before they started school. Working with experienced nursery leaders, I developed ‘Songs, Sounds and Stories’ weekly sessions for parents and toddlers, targeting children who were at risk of starting school with poor pre-literacy skills. 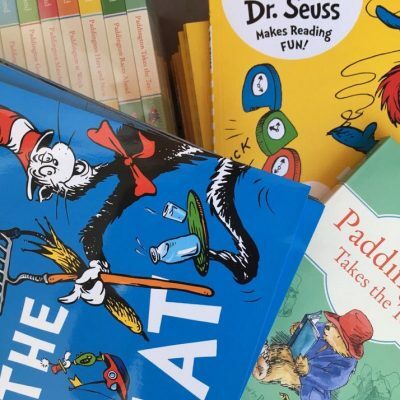 The final strand of the project to be developed was our termly after school Story & Craft Events, where the whole family has a chance to share the excitement of reading. Following positive feedback from the school, the team at Learn to Love to Read approached a second school. New volunteers were recruited and the second school signed up. We were registered as a charity on 23rd October 2017. Now the project had grown to around 50 volunteers working with 7 primary schools in Wandsworth and Merton. What kind of children/schools do you hope to reach in your work? For the most part we work in partnership with primary schools that have a significant proportion of children in need. We look for schools that serve a mixed population and that are geographically located in an area where there is recognised poverty. We work with any children identified by our partners as needing additional reading support. These children may have EAL, receive pupil premium, be recent arrivals to the UK, have challenging home circumstances or come from low income families. Or they may just be finding learning to read a bit hard. We also work with parents. Our weekly preschool activities, termly Story & Craft Events and parent training sessions provide an opportunity to build relationships with and encourage parents who need additional support to engage with their child’s education. And finally we work with toddlers who may be at risk of being significantly behind their peers when they start school. We do not just provide people to hear children read. Our volunteers are specifically trained to have the maximum impact and work as part of a mutually supportive team within our partner schools. We are passionate about intervening early and involving whole families. We believe both are vital. So we also target younger siblings who otherwise risk starting school at a disadvantage because of lack of early language exposure and we take specific steps to engage parents in supporting their children’s reading at home. We are an integral part of our schools – a regular, frequent presence throughout the school year. We are committed to maintaining these relationships long term, as this enables trust to build and interaction to flourish. The impact from this is cumulative over several years. What are your hopes for the future of your work—what do you hope to achieve? We want all children to have positive, frequent reading experiences and to be enabled and empowered by learning to love to read. We want to reduce the number of children whose opportunities are limited by poor reading skills and help schools give children the necessary tools to reach their full potential. We want to give parents the motivation, skills and confidence to support their children’s reading at home. Any plans for future directions? Our main aim now is to continue to refine the service we offer, maintain the highest of standards in the schools where we now work, and recruit new partner schools across Wandsworth and Merton. We have found a model that has been enormously well received by schools and which offers excellent value for money, because it uses teams of volunteers from the local community. Partner schools pay an annual subscription for our services and we seek donations and grants to help us cover our full costs. We will be looking to find additional funding to allow us to continue to grow. What has the impact of the GAB book gifts been? It has been very exciting meeting the team at Give A Book who share our passion and, like us, know that becoming a confident reader will change a child’s life. 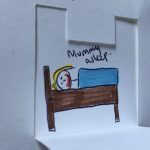 National Literacy Trust research tells us that one in eight (13.1%) children from disadvantaged backgrounds do not have a book of their own at home. Yet research also shows that children who say they own a book are 15 times more likely to read above the level expected for their age than their peers who say they don’t own a book (28.8% vs 1.9%) and are four times less likely to read below the expected level (12.9% vs 48.1%). We love to give books as gifts to the families we work with but as our work has grown we have struggled to meet the cost of doing this. Because of our partnership with Give A Book, last term we were able to gift a book to every child who had attended our preschool sessions and every child who had received one-to-one support from a volunteer. Now all of those children have at least one book of their own at home. As we grow, we need to buy initial supplies for the kit boxes in our new schools. Give a Book have also generously offered to provide the books for three schools starting new Learn to Love to Read activities in September. Once again, for a small charity such as ourselves, which operates on very limited annual budget, this is a huge blessing for which we are very grateful. And anything else you’d like to say or draw attention to?